My latest book, Living and Dying in Brick City: An ER Doctor Returns Home is my way of giving back to the many educators who helped me escape the thought that education wasn’t for me and the belief that I wasn’t good enough. You have both championed and inspired me—and I thank you. My book encompasses the philosophy of reaching each student with a level of creativity and a touch of reality. It is part memoir, medical, self-help, and entertainment with solutions and strategies following each chapter. Brick City captures the imagination of students in any number of disciplines, including science, medicine, African American studies, sociology, history, philosophy, law, creative writing, sports, business, management, and politics. As a doctor who practices medicine in his hometown, I always look to share stories that tie into students’ lives and learning experiences, both in and out of the classroom, which will help them to navigate the world better prepared and equipped to understand and handle the multilayered complexities of life’s scenarios. Educators and readers alike tell me, Brick City does just that, bringing together health, community, science, history, religion, business, friendship, family, hope, and ultimately humanity. My goal is to inspire each and every student to reach the highest level possible. I have talked about my life journey and books at hundreds of schools nationwide and have appeared as a guest on numerous television and radio programs. I understand the importance of being an engaging, motivational speaker, and students listen and are inspired because they know I have lived through the obstacles and challenges they are facing. They know that if I was able to overcome and overpower, then so can they. I am “real” to our students and have received many heartfelt testimonials from both students and educators. Students have said, “Because of you, I believe I can do it. You make education fun and cool. And like you said, if someone calls me a nerd today, it is okay because they will be calling me boss tomorrow.” Students also have told me, “Seriously, I don’t like to read. I really don’t like to read, and your book is the first book that I ever read cover to cover.” Educators have shared stories of how their most challenging student has opened up in their classroom after reading a passage in my book that relates to their life. And therein lies the power: we are all connected through our stories, and it is only by sharing our challenges, fears, failures, and victories do our students begin to believe that they are hearing and feeling the entire story. I look forward to visiting more schools and feel confident in saying, Living and Dying in Brick City: An ER Doctor Returns Home delivers an incredible read for any common reading experience. 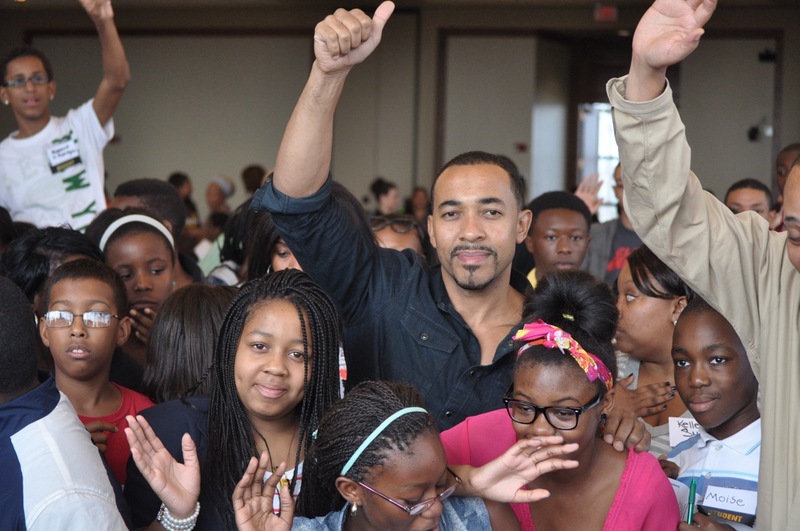 Please visit my website DrSampsonDavis.com to see if I’ll be speaking at your school. As a misguided, often rebellious youth, I never imagined my life journey would lead me to becoming an author and, through writing this book, I am stepping outside of the hospital walls, still practicing medicine in the way of prevention and inspiration, and reaching thousands of students and educators. I can’t wait to see the effect Brick City has on students nationwide. I’m excited! Sampson Davis was born and raised in Newark, New Jersey. He is a board certified emergency medicine physician and author of the New York Times bestsellers The Pact, We Beat the Street, and The Bond. He is the youngest physician to receive the National Medical Association’s highest honor, the Scroll of Merit. He is a recipient of Essence and BET humanitarian awards and was named by Essence as one of the forty most inspirational African Americans. He is a founder of the Three Doctors Foundation and practices medicine in New Jersey. Click here to view a Facebook photo album of Sampson Davis’s mentoring program.